The Newbery Award — this year subtitled “Did Not See That Coming” — brought us some interesting books that had no pre-award buzz whatsoever. I’m looking forward to reading most of these for the first time and I suspect that I’m not alone in this. 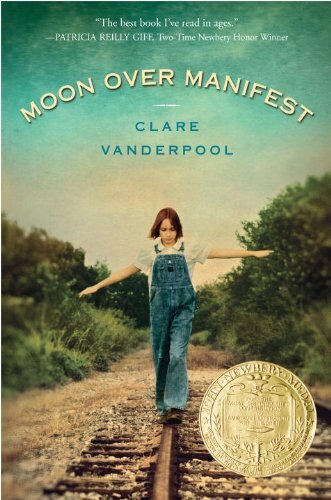 Moon over Manifest, written by Clare Vanderpool, is the 2011 Newbery Medal winner. I have this book on my TBR shelf and imagine that I’ll be reading it this afternoon now. Total surprise in that I’ve heard nothing about this book around the kidlitosphere. There were four Newbery Honor Books named. Turtle in Paradise, by Jennifer L. Holm, I have read and enjoyed. I’ve seen some talk about it for Newbery, and am very happy to see it in the list. One Crazy Summer, by Rita Williams-Garcia, was altogether expected to make the Newbery list, and many people thought it would pull in the gold. Dark Emperor and Other Poems of the Night, written by Joyce Sidman, was a book I’d been hearing in conjunction with the Caldecott Award. I’d never thought of it for Newbery and haven’t read it yet. I do like Sidman’s poetry, so I expect to enjoy this title. Heart of a Samurai, written by Margi Preus, is another book that appeared out of thin air as an award-winner. I’ve seen the book, but had not heard any buzz about it in terms of awards. Shut out of the Newbery winners were Keeper, Countdown, and Forge — all books that were talked about as near-certainities. The Caldecott was a little more in line with expectations, though the committee seriously needs to choose more titles for honor awards. This year it was really a travesty as there were some wonderful possibilities that were passed by. I’m happy to say that two of the books are Cybils Fiction Picture Book finalists. 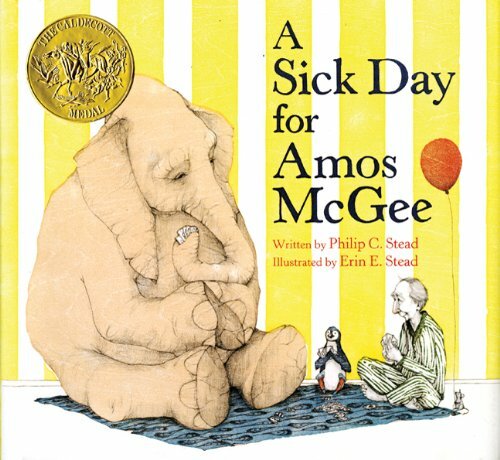 A Sick Day for Amos McGee, illustrated by Erin E. Stead (and written by Philip Stead), is the 2011 Caldecott Medal winner. A lot of folks were looking at this title for gold or silver. Interrupting Chicken, written and illustrated by David Ezra Stein, was a surprise for Caldecott. I like the book, but had not heard it mentioned in Caldecott predictions. Out of left field was honor book Dave the Potter: Artist, Poet, Slave, illustrated by Bryan Collier (and written by Laban Carrick Hill). I vaguely remember hearing about this book earlier in the fall, and then it dropped off the radar. What is more notable are the many titles that were not represented in the Caldecotts. I was personally pulling for Chalk, by Bill Thompson, because I think that the illustrations are amazing in their details, expressions, and perspectives. I thought Flora’s Very Windy Day was a long shot, but I couldn’t help but hope for its enchanting illustrations to be noticed. I’d heard Ballet for Martha and Dark Emperor suggested from more than one source. Personally, I was never convinced of the predicted win of City Dog, Country Frog. So, what turns out to be correct is the most widespread prediction of this years awards — that they were wide open. Back later with some more awards. Yes, my to read list is a little bigger this time around. Not that I _always_ have all the possibles read..but this year, not so many! Ah, yes. Moon Over Manifest and Heart of a Samurai (I cannot spell that!) were both on the MG Cybils list, but neither made the shortlist. I really enjoyed Moon, however. I'm going to have to check out the Caldecotts, now, though. I haven't read a single one! Wow. Those are surprising winners! I loved A Sick Day for Amos McGee and the expressiveness of the simple illustrations. Given Jerry Pinkney's win last year, I really expected something "fancier." Funny, though, how both help tell very classic stories. I gave up trying to predict these things long ago and now that I"m a librarian realize how few kids care about them, but it sure was an interesting year! I had some surprises too this year. I'll have to purchase several more for my library than I usually do. I hadn't heard of most of them either, but that just gives me more to read. It's a good year when different books show up on different awards -- means there's lots to choose from. Out of the five Newbery's the only one I've read is One Crazy Summer. For the first time in at least three years, I hadn't read any of the Newbery winners beforehand. I have some catching up to do! When I told my ten year old son about the Caldecott titles, his first reaction was, "What? No Chalk???" I concur. That is a huge miss by the ALA! Four out of the five Newbery honorees this year were historical fiction. I had read all four, and reviewed three of them on my blog The Fourth Musketeer (I didn't read "Moon" until December, but it was an Indie Best pick for kids in the fall). All are definitely worth reading. It's nice that you can comfort yourself that the Cybils DID give CHALK some well-deserved attention. I'm consoling myself that A CONSPIRACY OF KINGS and THE DREAMER got Horn Book Honor Awards. And I had hoped ONE CRAZY SUMMER would win the gold, but can't really complain since it got the Coretta Scott King AND the Scott O'Dell Historical AND a Newbery Honor. And THE DREAMER got the Pura Belpre. It was interesting yesterday to hear you talk about how the goal of the Cybils is partly to produce a well-rounded shortlist. A nice tool for librarians! I'm glad that some books that were passed over today are getting some attention from the Cybils. I love learning about all of these new-to-me books! And I was thrilled to see that Joyce Sidman's DARK EMPEROR won a Newbery Honor. Like so many, I believe it is high time for an ALA poetry award! I was also hoping for Chalk to receive some attention - it is such a wonderful, dynamic book. A wildcard year it was! I'm looking forward to reading Moon Over Manifest and Turtle in Paradise - both sound like heartfelt stories. I did love Heart of a Samurai - fascinating look at a boy's experiences caught between two cultures. I was also hoping that Chalk would receive an award. The amazingly realistic illustrations have the power to draw the reader right into the story. After reading it with me, my toddler son went off on his own tried to draw his own dinosaur on our kitchen floor. He's never done anything like that before, unprompted.